I am making teriyaki tri-tip for Memorial Day. I want a Japanese vegetable side, besides all of the pickles I made. Chrysanthemum greens are an unusual vegetable that I discovered in making my Yosenabe. Chrysanthemum greens are 12-15 inches long. Unless they are absolutely fresh you should separate and rinse them, looking for rotted or discolored fronds. Trim the ends and refresh in cold water with a tablespoon of vinegar. 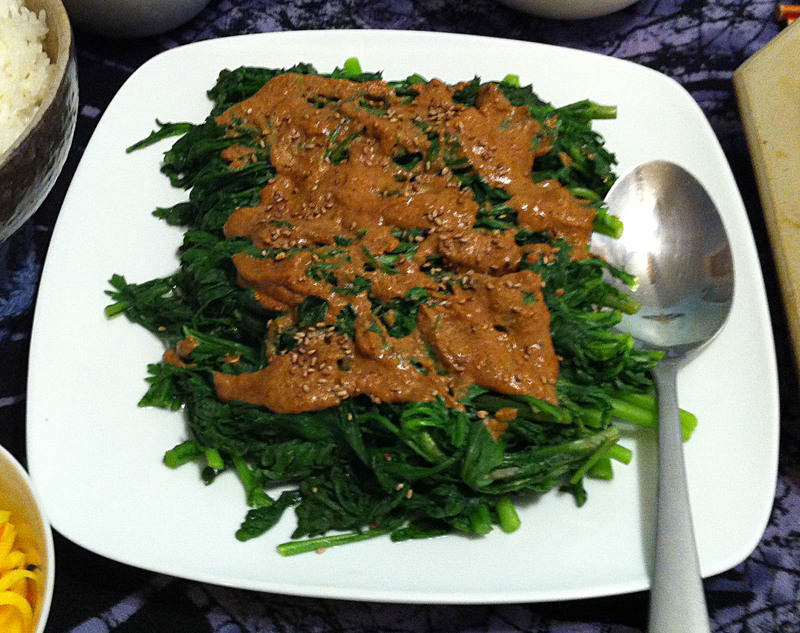 Chrysanthemum greens are tender leaves that cook very quickly, but also overcook very quickly. They have frilly leaves and stems that do not cook at the same time. For this dish, I will cut the greens in half and blanch the tops and stems separately. Sesame dressing is a common Japanese addition to simple vegetable dishes. On-line the recipes are all over the map with added garlic, chili and mayonnaise. I decided to make mine closer to the traditional dressing. I also made the addition of chili up to the individual diner. After Dinner Note: Even cut in half these were a bit awkward to eat with chopsticks. Next time I will cut them in thirds. 1. Toast the sesame seeds. Reserve one teaspoon of seeds and grind the rest to a powder. Tip: The fresh, toasted sesame seeds enhance the nutty flavor of the sesame seeds. 2. In a small pot, combine all of the sauce ingredients. 3. Stirring, bring the pot just to the boil and remove it from the heat. 4. Cool the sauce to room temperature. Tip: If the sauce dries out while sitting, add a splash of hot water and stir. 5. Bring a large pot of water to a boil. 6. Rinse and cut the chrysanthemum greens in half. Tip: The individual leaves of the chrysanthemum are a bit long to eat gracefully with chop sticks. Cutting the leaves in half both makes them easier to eat. It also makes for a more attractive presentation. Lay the less pretty stems down first and cover them with the frilly fronds of the top leaves. 7. Blanch the stems for 30-40 seconds. Remove the stems with a basket strainer. 8. Shock the stems in ice water and drain well. Tip: Shocking means to put the vegetables into ice water to prevent them from overcooking. 9. Arrange the stems on a serving plate and drizzle a bit of the dressing over them. 10. Bring the pot back to a boil and blanch the tops of the chrysanthemum greens for 20-30 seconds. Remove the tops with a basket strainer. 11. Shock the tops in ice water and drain well. 12. Arrange the tops over the stems on the serving plate and drizzle the remaining dressing over the chrysanthemum greens. 13. Garnish the greens with the reserved sesame seeds and a sprinkle of Nanami Togatashi (optional). 14. Serve at room temperature.